Crews from Southern California Gas Company and outside experts work on a relief well at the Aliso Canyon gas field above the Porter Ranch section of northwest Los Angeles, California. The invisible methane plume, captured on infrared camera by the Environmental Defense Fund, has driven thousands of nearby residents out of their homes, shut down two schools, and cancelled out a chunk of the state’s greenhouse gas reduction efforts. 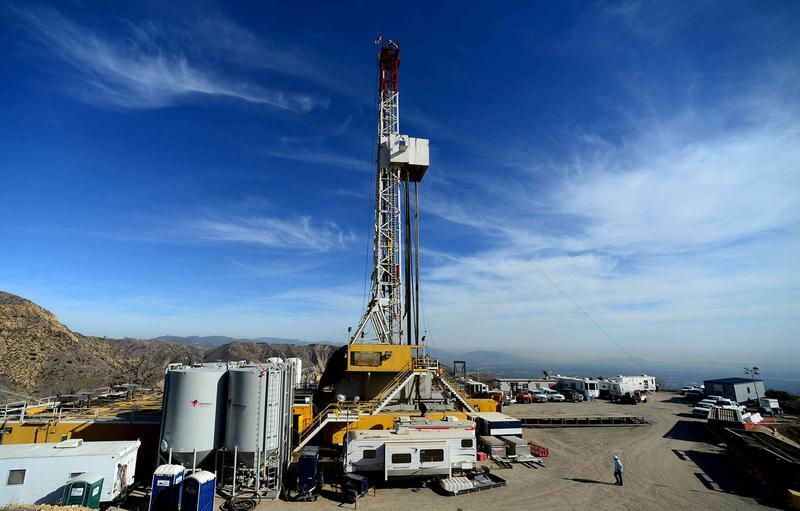 The Aliso Canyon storage field is one of about 420 underground storage places for natural gas. Jackson says most gas storage fields are old oil and gas fields, more similar in structure to enormous subterranean honeycombs than to actual hollowed-out caverns. So far the Southern California gas company has tried using mud and brines to counterbalance the pressure of the leaking gas, but their efforts so far have failed. Now the gas is bubbling down and out around the cement sheath. “At this point, it's an uncontrolled release ... that's just belching natural gas — about 2.5 million pounds of methane every day,” Jackson says. Some have called this the worst environmental disaster since the B.P. oil spill. Jackson says it’s unprecedented. “This leak is bigger than the methane that's emitted by all industrial activities in California, including the entire oil and gas industry. It's huge,” Jackson says. In terms of global methane emissions, though, Jackson says this leak is not that big of a concern. “You're not going to see a massive spike in the atmosphere because of this leak. It's huge, but it's not that huge,” Jackson says. The leak is also not likely to cause too much bad interaction with the ozone in Los Angeles. “The ozone in Los Angeles is catalyzed by hydrocarbons, rather than nitrogen oxides, but it's not typically catalyzed by light hydrocarbons such as methane and ethane. And it's also winter. And it's rainy. So that would only likely be an issue if this went into the summer — and even then it might not be the biggest issue,” Jackson says. The really big concern? There may perhaps be other traces of toxic gases in the leak that could cause devastating health effects to people in the area.